This is where it all started � the inaugural Derby City Classic in 1999. It didn't take long for the now-iconic event to show off the quality of play. For this month's entry in "Stroke of Genius," Wade Crane faced Danny DiLiberto in a race-to-three one-pocket match at the old Executive West in Louisville, Ky.
Down a game and trailing in the second, 6-3, Crane needed some magic to mount a comeback. He came out firing, pocketing three balls to knot the game at six balls apiece. He was left in the position shown in the diagram, needing two balls to take the rack. Crane had a natural angle on the 10 ball in his lower right pocket. Simply pocketing this shot wasn't the only thing he had to do, though. With the other two balls sitting against the left long rail, Crane needed to manufacture a game ball so he could take the rack and tie the match at 1-1. Sending the 10 into his pocket with moderate speed, Crane perfectly calculated his cue ball's angle into the 1. 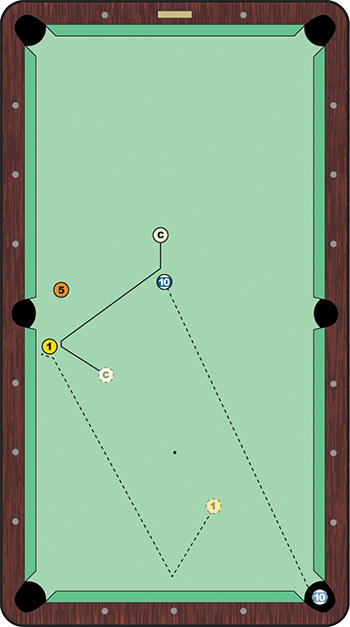 The double kiss off the long rail left the 1 ball headed to the foot rail while the cue ball lazily crept to the center string. The 1 ball bounced a diamond off the long rail, leaving a gimme for the game. Crane took the rack and managed to push the match to a decisive fifth game � but DiLiberto won the decider. Shots like these explain why people have been making the pilgrimage to Louisville for the past 17 years, though the 24/7 action doesn't hurt either.